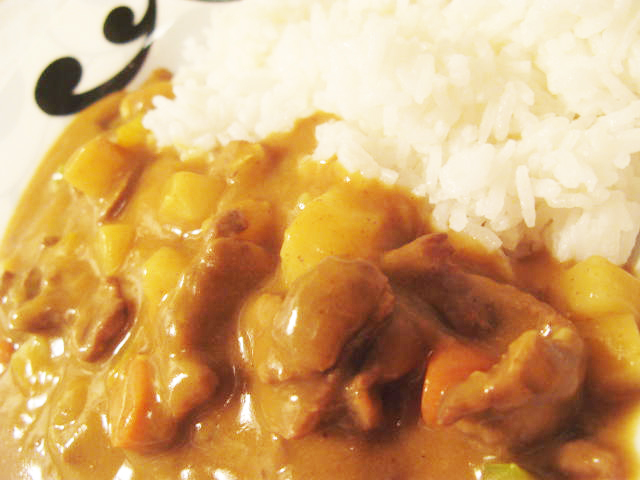 Japanese Glico Curry – the easy way out | Raptor Toe - Food, Baking, Fun. 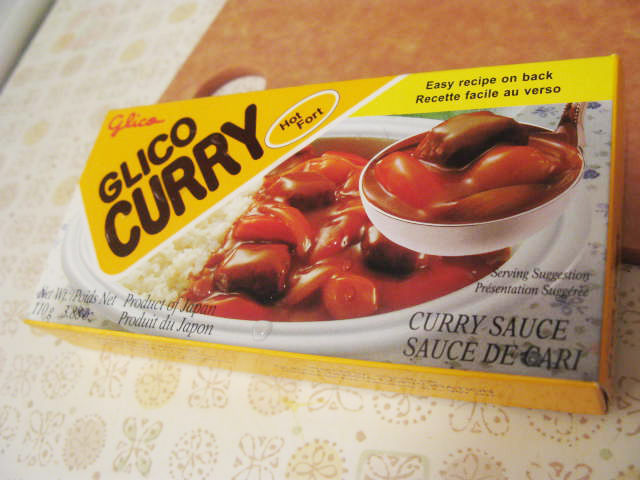 Glico curry is a Japanese curry. It’s super easy and I ALWAYS have a packet in my pantry. It takes no time to make and you get this wonderfully warm/thick comforting curry. You can find this at most asian stores, or everywhere if you live in Vancouver. ﻿First things first, I got some coconut rice cooking. Coconut rice is NOT Japanese, but eh. I love coconut rice and I eat what I want. 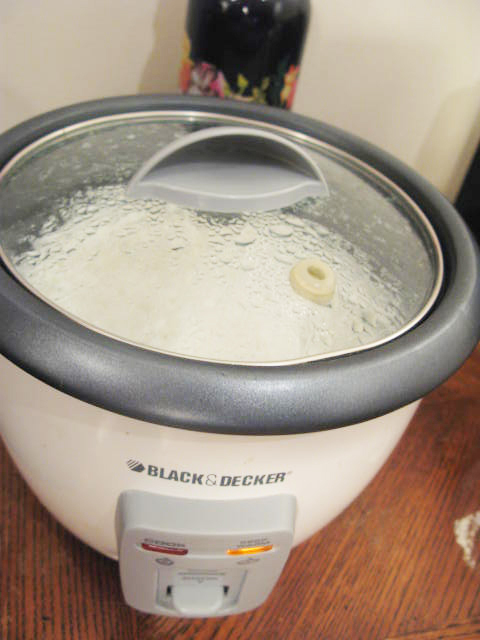 I also LOVE my rice cooker. But I honestly haven’t used one until the last year. I stood by my “rice isn’t hard to make, what’s wrong with you” argument. And it’s true, it isn’t. But it’s SOO much nicer to throw it in the rice cooker and let it deal with it. To make coconut rice, just substitute some of the rice cooking liquid with coconut milk. Now, onto the curry. This recipe is great for using up odds and ends in the fridge, or if you really don’t have much to work with. I had some thinly sliced flank steak I had purchased from T&T and an assortment of veggies. I took flank steak, zucchini, carrots, peppers, onion, potatoes, and began to sautee until slightly browned and the potato was almost cooked through. Create those flavour profiles people! You then add two cups of water, and allow to simmer for about 20 minutes. 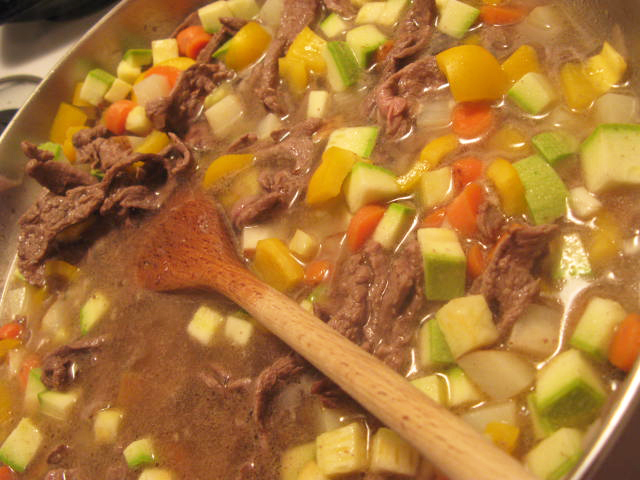 If your veggies/meat are well cooked by now, feel free to simmer for less. 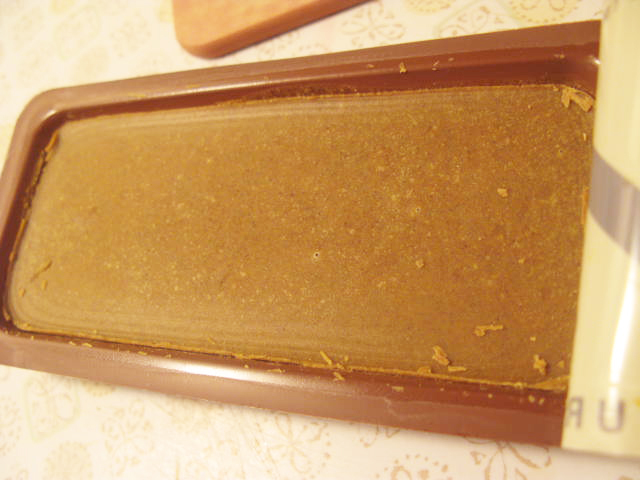 This is what Glico curry looks like. A big brick of delicious. This thickens the sauce as well. So if you wish for a thinner curry, add slightly less. I throw it all in, because I'm a glutton like that. 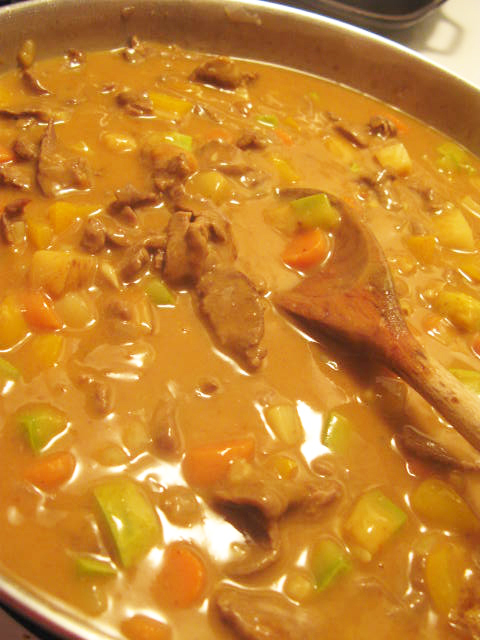 Add your curry chunks and stir to combine, allow to simmer further just until sauce thickens. After shot! The makeover is complete! By now your rice should have been done, if not you need to reevaluate your rice cooking procedures. Then you just serve and eat! Yum!! This never lasts long at home and we never have leftovers. 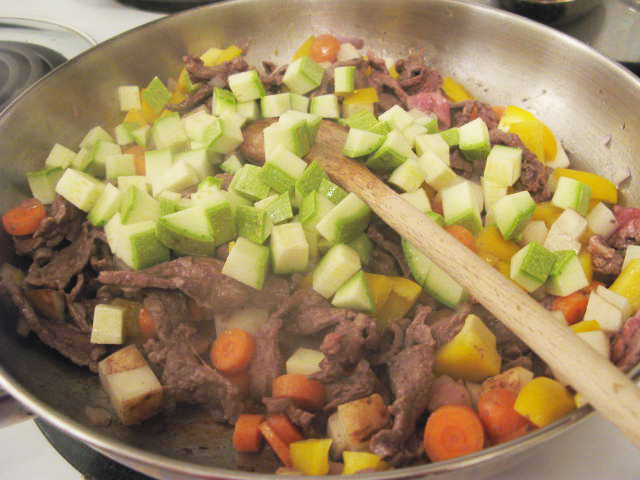 This entry was posted on Wednesday, October 6th, 2010 at 7:22 pm	and tagged with carrots, coconut rice, cooking, curry, dinner, easy, flank steak, garlic, glico curry, japanese, japanese curry, potato, zucchini and posted in Food. You can follow any responses to this entry through the RSS 2.0 feed. 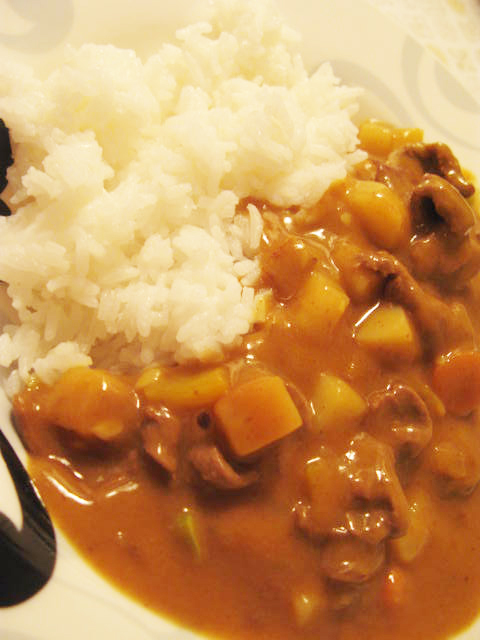 I love this Japanese curry, I ate it in Japan and whenever I can find a packet of it here in the UK I stock up. Thanks for the great post and instructions. I may link to this on my blog, let me know if you are happy with this. Thanks! And no problem, link away. 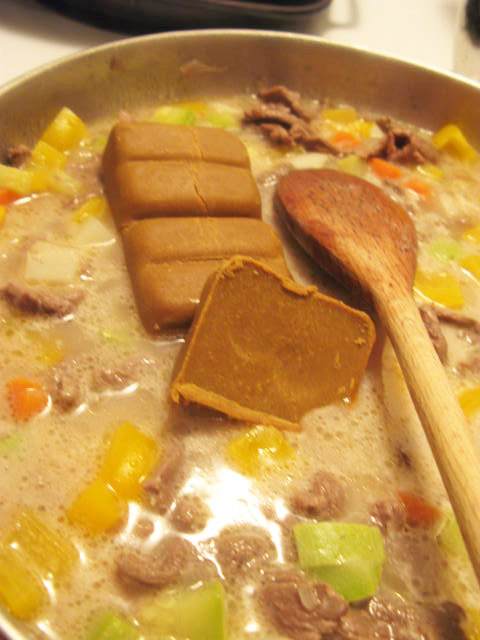 So I was googling the internet to find out how much glico curry sauce to use per meal, and I found your blog post. Hahahah! Oh craig. I’ll uh. explain on friday if you didn’t figure it out. I dont think the hot is very hot. But keep in mind if you use less you’ll have a very thin sauce. Thank you. I should have remembered that the paste is actually a roux … less paste (aka roux) + same amount of water = thinner sauce. 🙂 I’ll have to think of something else to deal with it. Maybe just give my mom a big glass of milk. Maybe add some coconut milk, or just give her some milk and lotsa rice! !